When I first scanned through Jack’s book, this principle resonated with me right from the start. Since I read the last principle first, I decided I wanted to share these principles with you over the last 64 days. I hope that you found some principles of success that are helping you achieve greater fulfillment in your life. One of the best things that you can do when you learn something new is to share it with someone else who desires to grow as well. The process of communicating what you learned to another helps solidify in your own subconscious mind the principles you are sharing. It is a powerful means of making it a part of your internal core. When we begin to teach others solid principles of successful living, we begin to change the world for the better. It may start in your own home first. You may take these principles to your workplace. People in your community may take notice of the positive changes in your life and ask you to share what made you successful. Be ready to spread these principles of success and empower others to live a successful life. Jack has many other opportunities to go beyond this book in applying these principles to you life. Be sure to check out his website and take advantage of his experiences and teachings to empower you in your journey. Thank you for sharing this journey with me through the last 64 days. I hope that you have been encouraged in your journey of success. I look forward to sharing more ideas and thoughts in the days to come. Day 63 – Start Now!….Just Do It! There has been a lot of helpful principles for success shared in the last two months from Jack Canfield’s book, “The Success Principles.” So many ideas that one could very well become overwhelmed and not do anything to move closer to success. So today’s challenge is to pick a few principles that resonated with you and start practicing those principles in your life. Every success begins with a dream. Every dream becomes a reality with the first step. Every step leads to living out a dream. Go back through the principles and choose the ones that you need to start practicing in your life. Take action on that principle today. Remember, it takes time for something to develop into a habit (27 continuous days or more). By taking a step today, you move closer to living out your dream. Please share what principles you found to be most helpful to you in your journey to success. A couple of years ago, I bought the marketing kit designed for Financial Advisors called, “Please….Make ME a little bit FAMOUS,” by Robert Krumroy. The basic premise behind every strategy he gave was to find ways to serve others. Each idea was built on this foundation to set you set you apart from all the other Financial Advisors you were competing with for business. People are naturally more inclined to work with someone who has a habit of serving others. People who find ways to serve, giving of their time or talent to their favorite charity or organization, live fuller lives, have fewer heart attacks, and reap benefits far greater than expected. Companies who consistently encourage employees to volunteer and promote opportunities for for their employees to volunteer have a much more engaged workforce. The rewards of serving are far more than the time spent doing it. Success comes to those who have a heart to serve others. Employers will favor those who have a history of volunteering over someone who doesn’t. Those who start volunteering early in life have a tendency to achieve promotions and achieve higher-level positions. Volunteering is also a great way of networking and building connections for more business and opportunities. If you don’t have a favorite charity, find one that resonates with your life, your passions, or your hobbies. There are plenty of opportunities to serve that will be fulfilling to you and that you will enjoy doing. Help make the world a better place by serving! There is a paradox in the world: the more you give, the more you receive. This paradox is understood by the wealthiest of the wealthy. It is understood by even the poorest of the poor. Those who struggle the most are more than likely the stingiest of them all. There is a reason this paradox actually works, both personally and in business. Picture in your mind someone who wants to keep as much as they can for themselves. They have a $1,000 cash in their hand. When you visualize this scenario, what kind of grip does this person have on the money in their hand? Do you have the same image that I do? The hand is gripping the money so tight, you couldn’t pry it open with a crowbar. Do you want to be friends with that type of person? Do you want to do business with that type of person? If that was your employer, how long would you continue to work there? Now picture in your mind a generous person with the $1,000 in their hand. How are they holding the money? 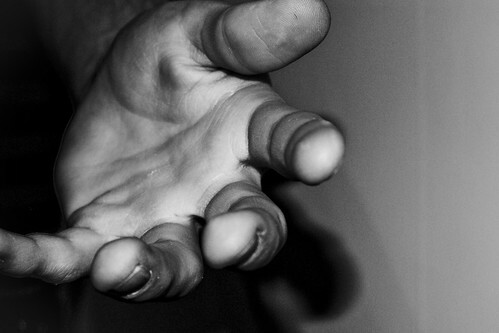 Do you have a picture of an open hand ready to give and receive more? A baby understands an outstretched hand as someone willing to give. The more open we are to giving, the more we invite into our lives. Giving is an attitude that invites generosity and gratitude. It creates an inviting demeanor. People are willing to work alongside generous people. People will go out of their way to help those who are givers. People who give regularly and cheerfully attract more to them because of their hearts are open to receive more so they can bless more. A great practice to start in your life is decide to give a certain portion of all your income away. Many start with 10% as a benchmark. Once you choose a starting place, you will find this principle opening doors that you didn’t know existed. You may want to consider giving of your time as well. Many charitable organizations have needs for volunteers to accomplish their mission. I have chosen to work with Big Brothers/Big Sisters. I enjoy the time I spend with my Little and having the opportunity to mentor a young man. Choose an organization that you are passionate about serving. This “secret” to getting more has a long track record. Make it a part of your life and you will find life is much fuller as a result. On Day 59, we talked about mastering the spending game. After you have learned to control your spending, there may still be some things you want to purchase, places you want to visit, or causes you want to help. Rather than sliding back into a pattern of spending more than you make, go make more money first. Jack has 5 suggestions for making more money. Become an Intrapreneur — There are a growing number of companies that will reward their employees financially for ideas that save money or make more money for the company. Look for opportunities within your company where improvements can made to generate more profit and ask for a percentage of increased profits. Find a Need and Fill It — Is there a need in the marketplace for an item or service? Look around you and the marketplace. What can you do to meet a need? You can either create an unique solution to meet a need or utilize a current idea to generate some extra income. Think Outside the Box — Perhaps you are in an industry that does things the same way and it has become the rut that everyone seems content to be in. Start thinking of ways to do something different that will resonate with others. Create a new opportunity that is beyond the status quo. Start an Online Business — The Internet has opened up huge opportunities for people to make extra money while still working their regular job. You can sell products and services from the comfort of your home. You can become an affiliate of different companies and market their products while making a percentage of what is sold. There is plenty of opportunity for creating more money online. Join a Network Marketing Company — There are hundreds of companies that utilize a network marketing business model to create a stream of income. Be sure to thoroughly investigate each opportunity that interests you. There are business opportunities from foods, beauty products, financial services, gift ideas, greeting cards, wellness, and many more. Find a company with a great history and products you like. When you begin to create other streams of income, you create for yourself a stronger financial foundation that isn’t dependent upon one source. Financially successful people have learned to create multiple streams of income. When you desire to have something or do something that requires more than you have available, make a habit of finding ways to make more money. You will build your self-esteem as you accomplish the goal and you will enjoy the reward without any regrets that debt brings with it. “We live well below our means. We wear inexpensive suits and drive American-made cars. Only a minority of us drive current-model-year automobiles. Only a minority ever lease our motor vehicles. On average, we invest nearly 20 percent of our household realized income each year. Mastering the spending game is a necessary principle to achieve financial success. Typically, we spend money on more things than we really need. If you were to go through your house and gather all the things that you have bought over the years that you did not touch or use in the last 12 months, how big of a room would you need to put all those items? Do you have clothes in your closet with price tags still on them? Do you have tools you bought for one little project and haven’t touched them for several years? Most of us have spent too much on items that were probably not necessary. Several years ago, I was a faciliator of the Financial Peace University program that Dave Ramsey put together to help educate people in the area of personal finance. Dave suggests in that program to start paying cash for items you want to purchase. The primary reason (and Jack mentions this too) for doing this is that there is more conscientious buying when using cash rather than credit or debit cards. The visual of actual cash leaving your hands causes you to pause more before purchasing. If you have been in the habit of spending more than you make and you are like the typical American, you have racked up some credit card debt as a result of your spending habits. First things first, stop borrowing more money!! (Strong emphasis for my own ears to hear.) Second, start paying off those debts so that you free up your most valuable asset, your income. Once you begin this process of mastering what you spend, you will find yourself making gains on what you are able to save and invest. Most wealthy people are frugal, and they may have gotten to be wealthy by being frugal. Being frugal doesn’t equal stingy. Frugal people look for and expect a bargain. They look for a means to spend less. As you journey toward a life of financial success, you will begin practicing the habit of mastering the spending game.